The National Radio Quiet Zone (NRQZ) was established by the Federal Communications Commission (FCC) in Docket No. 11745 (November 19, 1958) and by the Interdepartment Radio Advisory Committee (IRAC) in Document 3867/2 (March 26, 1958) to minimize possible harmful interference to the National Radio Astronomy Observatory (NRAO) in Green Bank, WV and the radio receiving facilities for the United States Navy in Sugar Grove, WV. The NRQZ is bounded by NAD-83 meridians of longitude at 78d 29m 59.0s W and 80d 29m 59.2s W and latitudes of 37d 30m 0.4s N and 39d 15m 0.4s N, and encloses a land area of approximately 13,000 square miles near the state border between Virginia and West Virginia. NRQZ coordination is required for all new or modifed, permanent, fixed, licensed transmitters inside the NRQZ, as specified for federal transmitters by NTIA manual section 8.3.9 and for non-federal transmitters by the FCC in 47 CFR section 1.924. The applicable radio services include but are not limited to: Public Mobile, Wireless Communications, Maritime, Aviation, Private Land Mobile, Personal Radio, Fixed Microwave, International Fixed Public, Satellite Communications, Radio Broadcast, Experimental Radio, Auxiliary and Special Broadcast, Cable Television Relay, Amateur Radio, Personal Communications Service, General Wireless Communications Service. Geographic Area Licensed Services are NOT exempt from NRQZ coordination. Applicants for some radio services are required to file their applications through independent frequency coordinators (e.g. APCO, AASHTO, PCIA, and IMSA). The coordinators assume the responsibility of notifying the Interference Office that an FCC application has been filed and hold the application until the Interference Office responds with its evaluation. Coordination under the West Virginia State Code Chapter 37A “Radio Astronomy Zoning Act” (WVRAZ) may also apply. Antenna location in latitude and longitude to nearest second. Antenna site ground elevation above mean sea level (AMSL). Antenna height above ground level (AGL). Concurrence letters are NOT provided with this type of evaluation. Applicants, should they decide to proceed with the development of facilities associated with any preliminary study, will have to complete the coordination process by providing ALL appropriate final system configurations, applications and engineering. See section entitled “Methods of NRQZ Coordination” for further details. If you have ANY questions or concerns, call the NRQZ office (304-456-2107) for assistance. VIDEO: Dr. Karen O’Neil briefly explains the NRQZ and the WVRAZ. Download the AutoPath Applicant Submission Template excel worksheet. The document contains detailed instructions on the information required for processing. Please take special note to the format of the required fields. For example, output transmitter power is in Watts, AMSL/AGL is in meters, and coordinates are dd mm ss.ss where spaces are required between the values. NOTE: This document can be used for coordination requests of MULTIPLE LOCATIONS, TRANSMITTERS, FREQUENCIES AND EMISSIONS! Send your completed excel worksheet and all supporting documentation to the NRQZ Administrator for evaluation. Download the nrqzApplicationMaker software to your desk. It have been made available to all applicants in the NRQZ for FREE courtesy of AKP Consulting Engineers. The nrqzApplicationMaker software has detailed instructions to guide you through the application process, resulting in a complete application file. Please include all required supporting documentation in your submission. Failure to do so may result in your RESUBMISSION of your coordination request. Send your completed zipped file and all supporting documentation to the NRQZ Administrator for evaluation. Need help with your nrqzApplicationMaker submission? Click here! Radio service and Call Sign. FCC File or NTIA Assignment Number. The required supporting documents are the FCC application form or the GMF/Spectrum XXI unclassified assignment. Antenna location in latitude and longitude to nearest tenth of a second. The required supporting documents are a FAA 1A survey, FAA 2C survey or Google Earth kml file. The NRAO nor the NRQZ office requires an applicant to aquire a site survey, however, if one has been done then this documentation should be provided with your coordination submission. If it is not available, the Google Earth kml file will be sufficient to process your analysis request. Antenna make, model number, and maximum antenna gain in dBd or dBi. The required supporting documents are (1) a manufacturers specification sheet detailing the antenna configuration and (2) the antenna gains in one degree increments for both the horizontal and vertical planes. Maximum output transmit power (dBW or W) per transmitter. If multiple transmitters are utilized, then indicate the number of transmitters that will be operating from each location. Send your completed word document and all supporting documentation to the NRQZ Administrator for evaluation. 4. Assuming that the assignment of a coordination case number (NRQZ ID x) indicates coordination. The assignment of a case number simply indicates that your case has been received and is in queue for processing. You will be contacted if there are possible errors in your submission or if additional information is required due to an NRAO or Sugar Grove Research Station objection. If your proposed system meets the NRAO protection criteria, you will receive a coordination letter suitable to attach to an FCC application or NTIA assignment. A detailed system configuration that includes all system gains and losses. Antenna gain with horizontal and vertical patterns in one degree increments (in Planet or TIA-804-B Antenna File Format). Antenna azimuth (degrees true) and elevation. 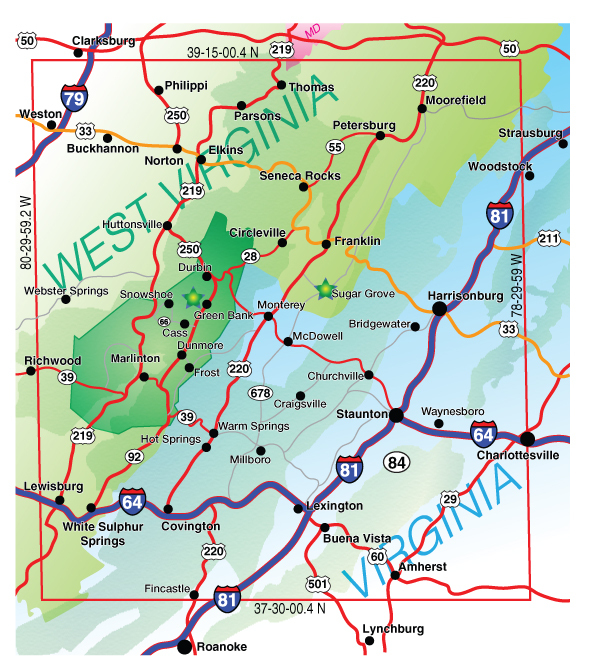 The Sugar Grove Research Station is a DOD Communications Facility located in Pendleton County, West Virginia. It is possible that your evaluation requires coordination from the Sugar Grove Research Station facility. Should this be applicable to your request, the NRQZ office will contact them and coordinate on your behalf. As soon as they have commented, your case will be finalized. Please do not contact them directly! Due to the case load currently experienced by both the NRAO and Sugar Grove Research Station, expedited processing is highly unlikely. If you are facing deadlines of some nature, please contact the NRQZ office for consideration. All expedited requests are handled on a case-by-case basis. The NRQZ Office reviews all applications to ensure that the computed power flux density at the reference point does not exceed frequency-dependent thresholds. In some instances, the transmitter power requested by an applicant exceeds the level that is harmful to observations in Green Bank or Sugar Grove. When this occurs, applicants should discuss possible modifications to their transmitters (e.g. using a directional antenna, relocating the antenna to an area that provides additional terrain shielding, or selecting a different frequency where the power density limits are different) with the Interference Office. In our experience, a technical solution can almost always be found to provide the area coverage desired by the applicant while simultaneously minimizing the impact of the interference upon Green Bank or Sugar Grove. In the extremely rare case when differences between the applicant’s desires and the Interference Office’s evaluation cannot be resolved, both the applicant and the Interference Office should forward comments on the transmitter installation to the FCC or IRAC for a final resolution. We emphasize that the Interference Office has no authority in the granting of an FCC license or a Federal Government frequency assignment. The Interference Office only has the privilege of submitting its comments on a particular transmitter installation to the FCC or IRAC. Applicants who feel that their applications have been evaluated unfairly or inadequately can contact the office of the Green Bank Site Director for a review of their circumstances. except for frequencies that reside in the radio astronomy observing bands listed in the US Table of Frequency Allocations, in which case the power densities listed in Table 1 of Recommendation ITU-R RA.769 shall apply. For a comprehensive list, click here.